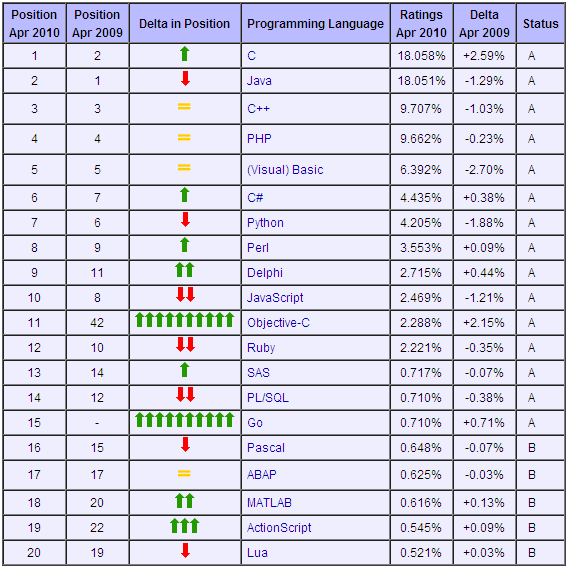 If you are a software engineer, you might have known Tiobe popularity index of programming languages. The index is updated on monthly basis. The following table shows the top 20 most popular languages this month. The index caught many people’s attention this month because C regained its No.1 position. Java, used to be No. 1 for years, dropped to No. 2. Although percentage wise Java is still very close to C, the declining of Java popularity can be eye-catching. So the main reason for C’s number 1 position is not C’s uprise, but the decline of its competitor Java. Java has a long-term downward trend. It is losing ground to other languages running on the JVM. An example of such a language is JavaFX script that is now approaching the top 20. In the application development, Java is still clearly the dominant programming language. The JVM languages like Scala (not in top 20 yet, but very promising) definitely worths watching. Tutorial: Easy vSphere Web Apps with Grails and the VI Java API What Does DevOps Mean for Cloud Professionals?